on August 2, 2017, 5:37 p.m.
Forrest Gump famously coined the idiom, “Life is like a box of chocolates. You never know what you’re gonna get”. But which chocolate would people choose? In a quest to find out more about our love affair with cocoa, YouGov asked 9,000 people across APAC about how they like theirs. 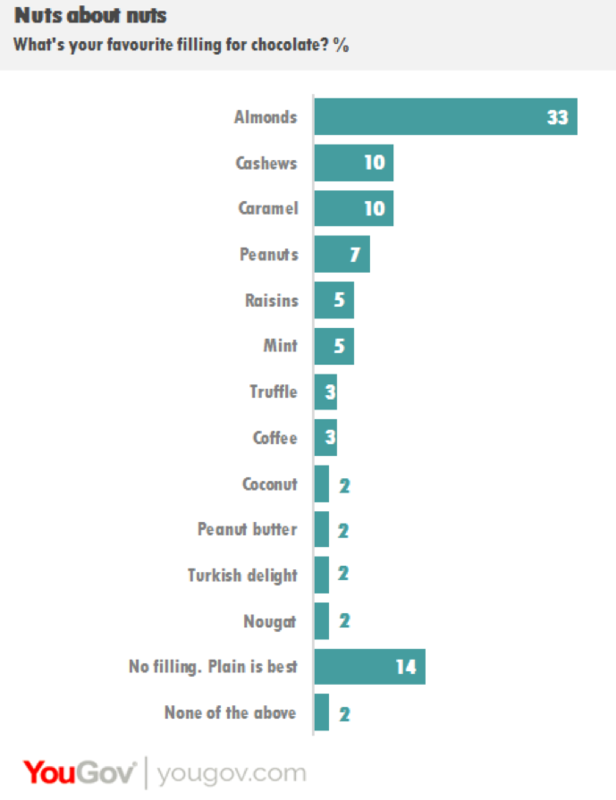 APAC residents are a nutty bunch, with nuts making up three of the top five most popular fillings for chocolate. Given a choice of twelve ingredients, the most popular are: almonds (33%), caramel (10%), cashews (10%), peanuts (7%) and raisins (5%). However, a fix of pure chocolate is more than enough for 14% of respondents, who prefer to eat theirs plain. As for the outside, dark chocolate is the most popular type of chocolate, favoured by 44% of those polled, followed by milk chocolate (35%), white chocolate (14%), then flavoured chocolate (7%). Among the 11 brands that we covered in the survey, Cadbury is APAC’s favourite brand of chocolate, chosen by a quarter (25%) of respondents regionally. Other popular brands include Ferrero Rocher (14%), Nestlé (12%), Hershey’s (12%) and Lindt (9%). But tastes differ over which is the best brand of chocolate: Godiva is particularly popular in Hong Kong (chosen by 23% locally but just 7% regionally); Toblerone is a firm favourite in the Philippines and Indonesia (favoured by 16% and 14%, respectively, against 6% regionally); while Nestlé is more than three times more popular in Vietnam than it is regionally (chosen by 39% locally but 12% regionally). Traceability and transparency have gained prominence in recent years, a trend reflected in consumers’ priorities when purchasing chocolate. Over half of the APAC respondents (58%) now consider fairtrade certification to be an important factor when buying chocolate, suggesting that ethical consumption is a priority for many in the region. This rises to as many as 77% in Indonesia and 70% in Thailand. By contrast, Hong Kong consumers are the least concerned in the region, though 38% still consider fairtrade certification to be important. Fairtrade certification is considered to be more important than advertising (33%) or packaging (49%) across APAC. However, taste is still the most important consideration – highlighted as important by a whopping 93% of those polled. Yet health concerns increasingly shape people’s purchasing habits. Almost three in five consumers (58%) think calories are an important factor in making a purchase decision. 43% of those polled also report that they eat less chocolate now than they did a year ago. Of those, three out of five respondents (60%) do so because they are increasingly health conscious. The next frontier for chocolatiers will be to rise to the challenge of keeping the same great taste while alleviating health concerns. While there are many things that divide society, chocolate is one treat that unites us. Across countries, ages and genders just 4% of people say they dislike chocolate. Next time you want to bring people together make sure to have a bar of chocolate on hand!